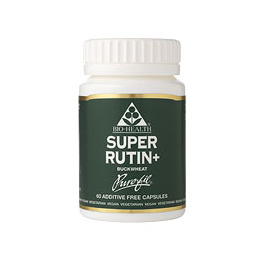 Rutin is a bioflavonoid or flavone that naturally occurs with Vitamin C. It is found in Buckwheat and fruit. Bio-Health`s Rutin Plus capsules contain naturally derived Rutin extracted from Buckwheat, standardised, then recombined with Buckwheat herb - its natural source. One capsule provides 60mg Rutin together with 120mg Buckwheat herb. Rutin, Buckwheat Herb - capsule: Vegetable hypromellose (HPMC). Take one capsule per day swallowed with water. Below are reviews of Super Rutin - Flavonoid Complex - 60 x 180mg by bodykind customers. If you have tried this product we'd love to hear what you think so please leave a review. Like this rutin as it has no additives also well priced.